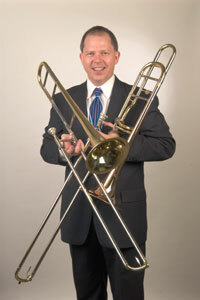 "Trombone Notes: ABCs Of Note Names"
The musical alphabet is an easy way the learn note names in any clef. First, use the musical alphabet: A B C D E F G, A B C D E F G, A B C D E F G, etc. When you get to G, the next name is always A if you're going up the staff. To go down, go backwards: G F E D C B A, G F E D C B A, G F E D C B A, etc. When you get to A, G is always the next name if you're going down the staff. Once you know the name of one line or space on any staff, you can use the musical alphabet to find the name of all the lines and spaces on that staff. On the bass clef, the first space is A. Using this alphabet, the next line up is B, the next space up is C, the next line up is D, and so on. When you get to fourth space G, the next line up is A. To go down from first space A, go backwards. The next line down is G, the next space down is F, and so on. It repeats as high or low as you want to go. When you look at the white keys on a piano, you are seeing A B C D E F G over and over again from low to high. This is an easier way to learn the trombone note names as you've known the alphabet from A to G by heart for a long time. Rhymes only work if you remember them, plus you must learn a new one for every clef. The musical alphabet works for every clef. You just need to learn one line or space name on that clef to get started.